First Annual Run for Shelby a huge success! Home/Uncategorized/First Annual Run for Shelby a huge success! On Saturday, September 24th, an event organized by Steve Countermine and Debi Zellan to commemorate Steve’s daughter, Shelby, was held. A group of motorcyclists rode around Sacandoga Lake and then met up at McGregor’s Pub for food, music and a great time. The proceeds of this event were earmarked for the Wilton Food Pantry. 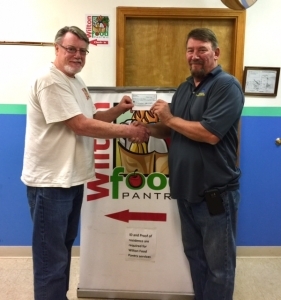 Steve is shown presenting a check for over $2,200 to Peter Maynard of the Wilton Food Pantry. This will go a long way towards helping our food insecure neighbors in the Town of Wilton. Thank you, Steve & Debi!